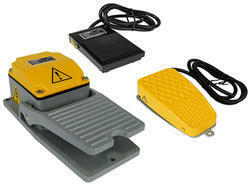 Our range of products include foot switches, mushroom push button switch and limit switches. Embicon is the Leading supplier and Distributor of of Giovenzana Foot Switches. 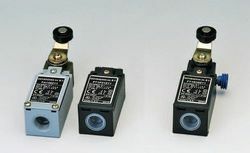 GIOVENZANA is a worldwide supplier of high quality foot switches, for use in a wide variety of industrial application. Foot switches can be used to turn electrical equipment on and off with the foot, freeing the hands to perform other operations or providing ergonomic improvement to a workstation. Special Features of Our Foot Switches. Heavy duty Construction,Single Or Double foot switch with emergency stop.Available Electric Or pneumatic control.Water, dust, splash resistant enslosureMomentary, maintained, or anti-trip actionIP 65 Enclosure.IEC529 Protection Rating. These tools manufactured by Giovenzana International are push-button switches that consist of a guard. The switches are equipped with EN418 emergency mushrooms and terminals with screws which are spring loaded or for printed circuit boards. Moreover, they conform to the IP65 protection rating. These Giovenzana push-button switches are capable of panel mounting on Ø 22.5 mm holes.